NEW ORLEANS – If you can believe it, the 2019 NAIA Indoor Track & Field Championships are being held this weekend at the Jackrabbit Athletic Complex in Brookings, South Dakota. The season certainly flew by. You might have missed it if you blinked. 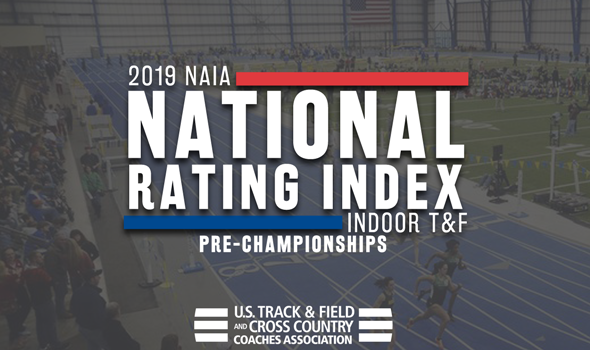 It’s time to take a look at the Pre-Championships Edition of the National Rating Index to get an idea of which programs are the clubhouse leaders to take home some hardware entering the biggest meet of the season. The 2019 NAIA Indoor Track & Field Championships get underway Thursday, February 28 and run through Saturday, March 2. Indiana Tech and Wayland Baptist (Texas) have been the cream of the crop in recent memory. Since 2014, the Warriors and the Pioneers have finished first and second – in some order – at the NAIA Indoor Championships four times. Don’t expect that to change that much this year as Indiana Tech and Wayland Baptist sit No. 1 and No. 2 in the TFRI. The Warriors have a clear advantage over the Pioneers, though. Indiana Tech is seeking its fifth national title in the past six years and has the horses to do it. The Warriors totaled 30 individual entries and three more in relay events for a grand total of 33. Indiana Tech might not have any top-ranked entries, but it does have nine in the top-5. Wayland Baptist sits second in the TFRI and will bring 14 total entries with it from the Lone Star State. What the Pioneers may lack in quantity, they make up in quality. Wayland Baptist owns three No. 1 marks nationally thanks to Tre Hinds (600), Quintaveon Poole (400) and the 4×400 relay, not to mention several more in the top-5. It’s a three-team race for the rest of the podium spots as No. 3 Doane (Neb. ), No. 4 Keiser (Fla.) and No. 5 Bethel (Ind.) should all have a say in the matter. The Tigers have the most combined entries out of the trio with 17, but don’t count out the strength of the Seahawks’ 11 and the Pilots’ nine. It’s going to be another battle for the women’s team title at the NAIA Championships. According to the TFRI, it’s going to come down to Indiana Tech and Wayland Baptist. The Warriors hold down the top spot in the Pre-Championships Edition thanks to their 26 combined entries between individual events and relays. Indiana Tech could expect big points from Destiny Copeland (No. 1, long jump), Doshawn Franks (No. 1, 600) and its 4×400 team (No. 1). Don’t count out Doneasha Brewer (No. 2, long jump) or Leondra Correia (No. 2, 60 hurdles), either. The Pioneers counter with 14 entries in individual events, including two top-ranked athletes in Devin Johnson (60) and Tiona Owens (triple jump). Johnson and Owens are also both ranked highly in the 200 (No. 2) and 60 hurdles (No. 3), respectively. Wayland Baptist is the defending national champion and has won two out of the past three titles. Concordia (Neb.) could cause a ruckus as it’s not too far behind at No. 3. The Bulldogs have the top-ranked athlete in the weight throw (Adrianna Shaw) and three talented pole vaulters who are all tied at the No. 4 spot on the Descending Order List (Allison Brooks, McKenzie Gravo and Erin Mapson). Aquinas (Mich.) and Doane (Neb.) make up the rest of the top-5 at No. 4 and No. 5, respectively.